Earlier this year, the president announced a $60 billion initiative to provide two years of “free” postsecondary training to students at community colleges. Schools receiving funding would be required to adopt evidence-based reforms to improve student outcomes as well as create programs that provide occupational training or fulfill transfer requirements to 4-year colleges and universities. However, these proposals do not fully cover the cost of attendance, just tuition and fees. Additionally, the proposals do nothing to actually lower the high cost of college, but merely subsidize today’s expensive tuition rates. · Only one out of three college students in the United States would be eligible to participate. · Over a quarter of college students would be prevented from accessing a public federal relief program because the program doesn’t allow students at private institutions or 4-year public universities to participate. · Only $32 billion of the $80 billion combined federal and state investment for President Obama’s proposed free college program would result in a degree or credential. The majority – $48 billion- would be a loss. Current estimates place the total college-going population in the United States at around 21 million, with about 15 million or some 72 percent of those students enrolled in public institutions. Free college proposals would not extend cost relief to students enrolled in private higher education programs, as a result more than one in four college-going students would automatically be prevented from accessing any form of tuition relief. Of those enrolled at public institutions, about 6.8 million, or roughly 45 percent are enrolled in two-year community colleges. This means that the president’s proposal would only benefit approximately one out of every three college students in the United States. The institutions where students would be ineligible to benefit from the president’s proposal serve a large percentage of the nations’ financially needy students. Just over 30 percent of Pell recipients attend public four-year colleges and universities while another 33 percent of Pell recipients are enrolled at private non-profit and for-profit institutions. These students demonstrate one example of how the president’s proposal would prevent those in need of financial assistance from accessing it. Why Push Students Towards Community Colleges? From an outcomes standpoint, the president’s proposal allocates taxpayer dollars toward one of the worst-performing sectors of American higher education: community college. It also seeks to drive enrollment into what is already American higher education’s largest sub-sector. Community college participants not only represent the group with the highest unemployment rates amongst individuals with a college education, but their earnings are lowest amongst all individuals having a post-high school credential. They also represent the largest group of students who begin college but never complete a degree. 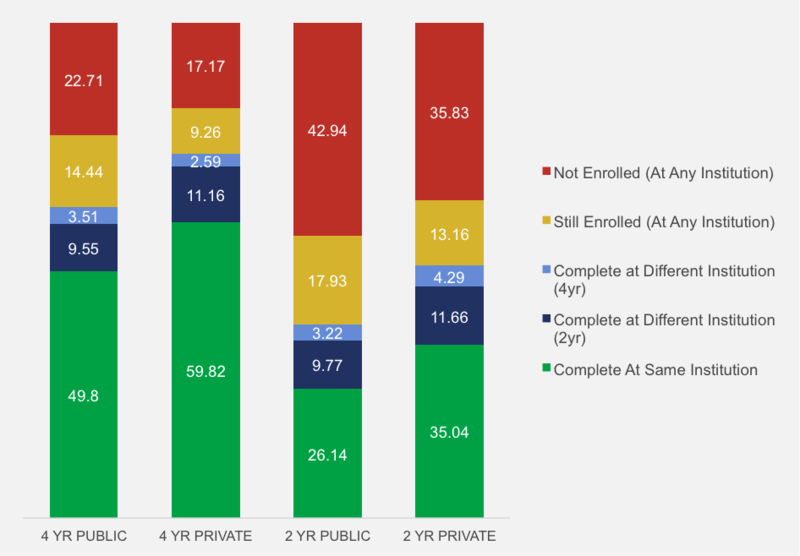 Some estimate that 48.8 percent of all students at two-year public community colleges have not completed a degree and are not enrolled at another institution 6 years later. As a sector, these students also have the highest tendency to default on their federal student loan debt. In general, federal investments in higher education are made in an effort to increase the degrees and credentials needed to ensure a productive workforce with lower unemployment rates, higher wages, and economic growth. By definition, free college proposals increase access to higher education. 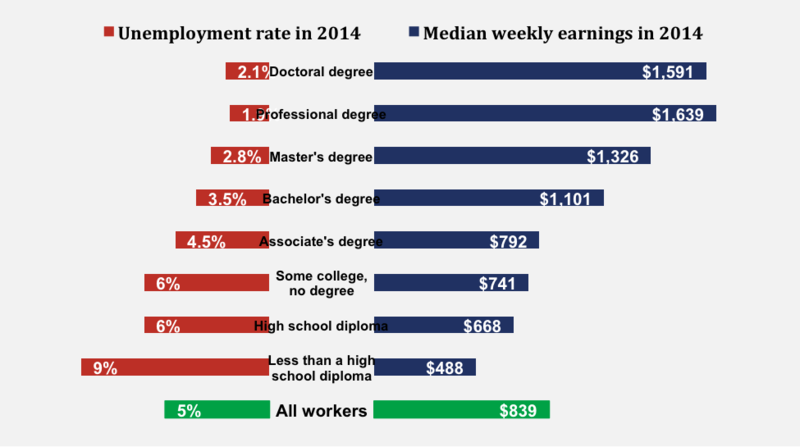 However, more students does not equate to more degrees granted, which yield the kinds of wage gains consumers seek or the tax and productivity gains that governments expect to realize. The lack of evidence or support for improving completion has been a common refrain amongst both economists and pundits. In fact, in November of 2014, just two months before the president unveiled his plan, the National Student Clearinghouse released an in-depth study that students at the public 2-year colleges at the heart of the president’s plan are highly unlikely to earn a degree or credential that is capable of generating economic benefits. As the chart shows, after six years only about 39 percent of public community college students end up completing a degree. This means that the president’s free college proposal would effectively be spending $36 billion of a $60 billion investment on up to 5.4 million students who will likely never receive any type of college credential. Add the share of the $20 billion that states would be required to invest on top of the federal match and the total potential loss on an $80 billion federal and state investment could be close to $48 billion. A full accounting of the economic costs is difficult to produce, especially given the migration of students from 2- to 4-year institutions. Still, research from the American Institutes of Research found that between 2004 and 2008 almost $4 billion in federal and state taxpayer monies through grants and appropriations went to community college students who dropped out after just one year of study. It’s important to note that the federal taxpayer’s $60 billion investment provides grant dollars to students regardless of whether they actually receive a degree. It provides aid whether the student is part of a family of four that lives below the poverty line or part of a family that makes $200,000 per year. The easiest way to understand the challenges with the president’s free community college proposal is to compare it to additional investment in, for example, existing federal programs designed to foster affordability, such as the Pell grant. If the focus of the program is to guarantee that individuals will complete and reap the benefits of advanced education, it is unclear why a policy should specify which entity provides the service. As many critics have already noted, free community college ends up subsidizing individuals for whom higher education may already be affordable. On the other hand, this proposal works against efforts to redress problems associated with under-matching: the idea that qualified students from less-affluent households do not end up pursuing degrees at competitive colleges and instead enroll in less-selective or two-year community colleges. In either of these circumstances proponents need to be able to articulate why a free community college run via state-based incentive grant programs would be more efficient or effective at improving affordability, access, or completion than Pell grants or other programs already in place. The under-matching issue is particularly salient because it suggests free college is highly inconsistent with existing federal education policy. For years, Congress and the Department of Education have pursued efforts to facilitate and improve consumer choice by stressing the need for cost calculators and ratings systems so that potential students can make decisions that best fit their unique circumstances. They have encouraged shopping for schools and programs, mindfulness towards things like graduation and attrition rates, and to make academic major and career decisions based on wages and future employment prospects. They have brought under- and over-matching into the national policy debate and actively sought ways to help students avoid making college-going decisions based on what costs the least and instead focus on where their skills and talents fit best. The current free community college proposals effectively throw nearly all of this by the wayside with incentives for students to enroll in institutions with the highest attrition rates, some of the lowest wage curves and the greatest unemployment variability of any post-high school training institution. They make cost the main driver of the educational investment decision, without placing any downward pressure on the cost of college. They effectively place a financial penalty on millions of poor students for choosing a 4-year public or private option that may be a better fit for their capabilities or increase their chance of graduation. As policy goes, promoting choice while financially encouraging participation in a single sub-sector sends consumers mixed signals. It also creates economic inefficiencies by giving free college to students at one institution type without regard for what they’re studying. This risks an overflow of students in programs that labor markets neither need nor want. In the current proposals, free does not attempt to drive down the costs of providing students with an education, but instead shifts the burden of paying for higher education away from students and onto taxpayers. A balanced policy discussion on these proposals must consider the costs and tradeoffs. Not every student benefits from this proposal and not every state will be willing or able to participate. Where public resources are scarce, the fact that so many students start college but never finish raises important questions about whether existing funding could be more efficiently allocated to achieve more favorable outcomes. There is strong public agreement that policymakers need to develop new ways of promoting higher education completion and build new tools that will help students, institutions, and government manage college affordability. Every option should be weighed through a balanced assessment of the extent to which it meets the needs of all parties that it may affect, the costs on taxpayers, and its impact on affordability. According to the National Center for Education Statistics, 6-year graduate rates for undergraduates are less than 60 percent nationally while the equivalent metric for students at 2-year colleges is only about 30 percent. Shapiro, D., Dundar, A., Yuan, X., Harrell, A. & Wakhungu, P.K. (2014, November). Completing College: A National View of Student Attainment Rates – Fall 2008 Cohort (Signature Report No. 8). Herndon, VA: National Student Clearinghouse Research Center. Source: The American Institutes for Research 2011 report, The Hidden Costs of Community Colleges. http://www.air.org/sites/default/files/downloads/report/AIR_Hidden_Costs_of_Community_Colleges_Oct2011_0.pdf. Chad Miller is a former director of education policy at the American Action Forum.